"Wheel coatings are becoming a focal point of individualization for car buyers, many of which are drawn toward metallics, such as bronze and rose gold, as well as vibrant multi-faceted colors and matte finishes." 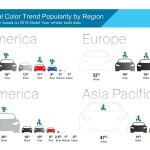 PITTSBURGH--(BUSINESS WIRE)--PPG (NYSE:PPG) today announced its automotive color trends data, noting a rise in popularity for green automobiles globally. While monochromatic colors such as white, gray, silver and black continue to dominate globally, approximately two percent of SUVs in North America today are green. The color continued to have a strong presence at the 2018 North American International Auto Show, with featured applications on the Mercedes G-Class and iconic Ford Mustang Bullitt. PPG’s unique position as a color leader in multiple markets enables the company to observe and translate emerging global color trends for customers applications, including consumer goods, automotive color, as well as residential, commercial and industrial design. The color forecast is brought to life through four color stories under the “We are” theme. 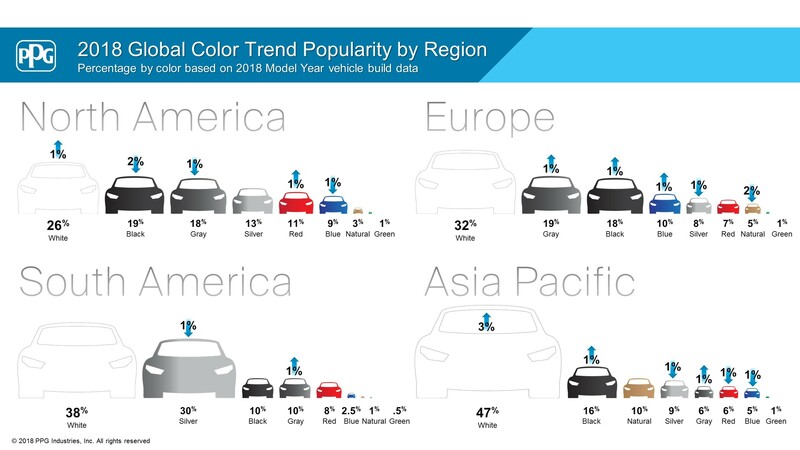 These colors represent trends for the automotive model years 2021 and beyond, and are presented to automotive original equipment manufacturers (OEMs) in 2018-2019. With It: This color collection reflects a design aesthetic that is youthful in spirit, playful, artistic and energetic. With overtly diverse and expressive colors, the chromatic palette creates abstract glamour and implies a contrast of strength and vulnerability. Layered color effects add dynamic intensity to traditionally primary hues, represented on the car’s body, custom wheel colors or interiors. With Class: Centered around a contemporary version of classic elegance and refinement in our high-tech world, this theme comprises multicolored darks to express an exotic and sophisticated tone. The palette contains rich wood-inspired browns, warm sandy beiges and saturated jewel-toned reds. Metal inspired accents of copper and gold, often seen in PPG’s wheel coating applications, balance the darker shades. With Out: A theme that connects with a design aesthetic that emphasizes minimalism, a “less is more” approach and a connection to the environment. This palette emphasizes simplicity and peacefulness. Organic greens, mixed browns, and soft stone-inspired hues work together to replicate the natural world. Because PPG’s paint colors are sold in more than 70 countries, developing color trends is a global, cross-cultural effort. Collaboration between PPG’s more than 20 color experts generates a fact-based approach to color trends and consumer preferences, resulting in a unified voice on color direction. The company’s color stylists around the world specialize in industries that include consumer electronics, architectural, automotive and aerospace. PPG experts study consumer mindsets, building material trends, wellness preferences and more to select a curated color forecast that resonates and is reflective of current consumer attitudes and spans cultures, regions and markets. EDITOR’S NOTE: For more information on PPG’s automotive color trends, visit https://news.ppg.com/automotive-color-trends. For more information on PPG’s architectural coatings color trends, visit newsroom.ppg.com/2019colortrends.